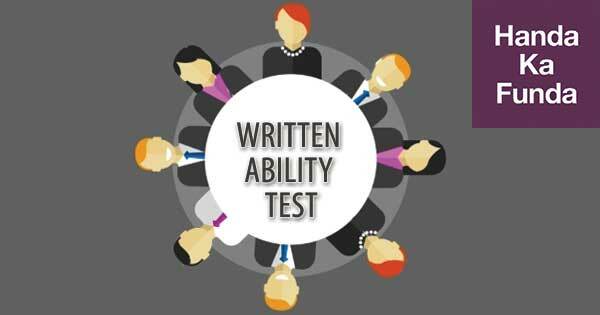 Over the last few years, most of the top B-schools have switched over from group discussion to writing ability test (WAT). There are compelling reasons why this has happened. It will be prudent to understand them before we begin our preparation for the WAT. The most important reason, I feel, behind this change is that, unlike in GDs, in an essay, it is impossible to borrow the content from anyone else or further develop someone else’s thoughts. You must entirely depend on your own content and reasoning. In fact, GDs are meant to test your ability to assimilate diverse points of view along with your own, while an essay is meant to singularly reflect how you think independently. The second reason is that essay writing, in fact writing in general, requires far greater intellectual discipline than speaking – especially speaking in a GD – as while speaking to someone you usually have a second chance to clarify yourself. Writing does not offer us that luxury. What we put down on paper must answer the questions that arise in the reader’s mind as they read it – a task immensely complex and challenging, as we do not know who the reader is. The essay is our only interface with the distant reader. Another reason behind the introduction of the WAT is the capacity of the writer’s essay to reflect their personality. The viewpoints you express in the essay give the reader a glimpse into your philosophy of life, your belief system, and your guiding principles. The order in which you present your ideas give the reader an idea about your priorities. One of the most difficult challenges to overcome while writing is translating the abstract thoughts in one’s mind into concrete words that not only are the closest approximations of these thoughts but also must be comprehensible to the intended audience who is not in our immediate company. It is the ultimate test of communication skill. Additionally, the evaluation panels of B-schools find it much easier to examine your perspectives and your thought process in the quietude of reading than in the (usual) chaos of a GD. The topics of WAT assignments encompass topical (current affairs or static) issues, case studies, and even abstract ideas. The time allotted for the task may vary from as little as 10 minutes to 30 minutes. Usually most B-schools offer 15 to 20 minutes. While some basic criteria of evaluation remains the same for most WAT assignments, the seriousness with which the evaluator looks at your content is directly proportional to the time allotted. The greater the time allotted, the greater the expectation of comprehensiveness of perspectives and analysis. A 10-minute essay is a little like an extempore assignment. The panel will look at your relevance, basic (fundamental) perspective on the topic, your organisation and coherence, and your ability to concise a complex idea into a simple yet clear message. It is similar to briefing someone very important – like a CEO – on your ideas in a very short time frame. It is primarily a test of prioritisation and articulation. A 20 or 30-minute essay gives you more time to develop your idea, which you must use to demonstrate your analytical ability and reasoning. It offers us not only more time to think but also greater opportunity to consider viewpoints which may be different from our own. While evaluating the essays, the panel primarily looks at the following four parameters: clarity of thought, simplicity of expression, comprehensiveness of perspective, and robustness of reasoning. Your essay needs to demonstrate your analytical ability which you bring into play when you identify the keywords of the topic, define them sufficiently, and create a suitable framework for discussion. I am using the word ‘discussion’ because the essay, at its core, is always a discussion, a dialogue between you and the reader. As you begin to write your practice essays, you will realise that you are able to express clearly only if you are absolutely clear in thought. Any confusion in the mind will invariably reflect in the essay, and an experienced reader will pick it up instantly. In an attempt to impress the evaluators, most candidates pepper their essays with arcane words, excessively long sentences, and convoluted, verbose arguments that, unsurprisingly, achieve the opposite effect. The reader spends very little time on your essay unless the essay has something fantastically interesting to offer the reader, which is seldom the case at this level. The essay must reveal in words exactly that which you have in your head, provided what you have in there is clear. I always liken a beautifully simple essay with a classic Federer slice. When you watch it, you feel that even you can do it, but when you get down to slicing the ball yourself, it is one of the hardest shots to emulate. Simplistic is easy, simple is difficult. A well-rounded essay demonstrates an awareness of all angles of an issue on part of the writer. In a 10-minute essay, the first two parameters may be emphasised, but in a longer task, the panel will expect you to look at issue beyond your personal opinions and bias. In fact, a sound analysis of the topic is only possible when you are willing to admit into your thought process the perspectives which you would normally reject. How you support your standpoint is of great interest to the panel, as they look at your position neutrally without letting their own viewpoints interfere with their judgement. This means that you do not have withhold the ideas which may be different from those of the evaluators. They are primarily interested in how you support you position through arguments, information, and illustrations. An essay that scores well on these four parameters is usually reflective of a writer who is well-informed, who has good communication and reasoning skills, and who has an open and curious mind. These all are very valuable essentials in today’s B-school student and tomorrow’s manager. Thinking that all you need to do write a good essay is to start writing essays is similar to thinking that you can ace the CAT simply by taking the mock exams. It only works for someone who has perhaps taken the exam before, and has the basic concepts in place. Similarly, improving by only writing works (to some extent) for those who are already experienced in writing – for example, professional writers. It certainly does not work for someone who last wrote an essay three or four years ago. What is then a good starting point? You cannot begin to write good essays unless you have read a few stellar essays through which you can observe how a skilled writer develops an idea and establishes a very human connection with the readers. The following are three of my all-time favourite essays. I have read them countless times, and every time they have surprised me with something new. Please find them on the internet. I am certain you will find them as thought-provoking as inspiring.